Please pray as another line of strong storms is expected to hit the southern parts of the US by mid-week. 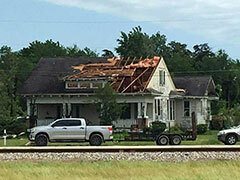 Approximately 21 tornadoes touched down across five states including Alabama, Texas, Louisiana, Mississippi, and Ohio. "The fence around his pool was pretty much blown down. He had three giant pine trees that had blown over in the field," Ohio resident Erv Howard told reporters as he cleaned debris from his brother's yard. In Franklin, Texas, residents were caught by surprise when an EF-3 tornado ripped through the town of fewer than 2000 people. "My house was just lifted, scattered over the backyard," one resident described. "We've lost about half of the south side of Franklin. It's totally destroyed," Robertson County Judge Charles Ellison told reporters. The destruction included 55 homes, a church, and several businesses, but no fatalities. That wasn't the case for other parts of the country. The storm's smallest victims, ages 3 and 8, were killed when a tree crashed into their car in Angelina County, Texas. "I noticed the tree had fallen on their vehicle and I knew it wasn't a good outcome," said a witness. In Louisiana, power outages and flash flooding struck after torrential downpours and heavy winds. Two people died as a result of the flash flooding, including 13-year-old Sebastian Omar Martinez whose body was found in a drainage canal. The aftermath from the severe weather is also affecting travel. At the nation's largest airports there were thousands of flight cancellations and long lines of stranded passengers. "This is very, very, very difficult and the help is negligible. It's negligible," said Liat Rudberg, who was stranded at Charlotte Douglas International Airport. The first line of weather pushed through parts of Washington, DC, and Virginia overnight and off to the east. However, another line of strong storms is expected to hit the southern parts of the US by mid-week.